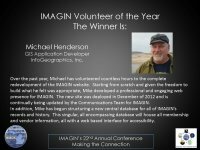 The IMAGIN Board of Directors each year selects an outstanding volunteer that has dedicated hours of work and has gone above and beyond the call of duty as a member of IMAGIN. 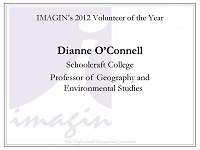 The award is typically presented at the IMAGIN Annual Conference at the closing day awards luncheon. 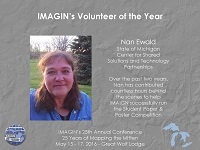 As a volunteer-run organization, IMAGIN depends heavily on the contributions of its membership. 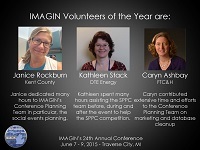 Board members are often recognized for their support in keeping IMAGIN running. 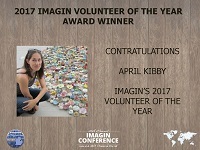 On occasion, an IMAGIN member will step up and provide services or assistance to the organization or to others on behalf of IMAGIN. 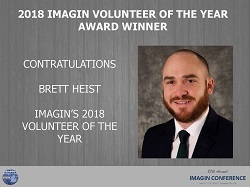 The IMAGIN Volunteer of the Year Award recognizes an IMAGIN member not serving on the Board of Directors, who has given the most of themselves to help further the goals of the organization. 2018 Brett Heist, Moore & Bruggink Inc.
2014 Brooks Kelley, InfoGeographics, Inc.
2013 Michael Henderson, InfoGeographics, Inc.